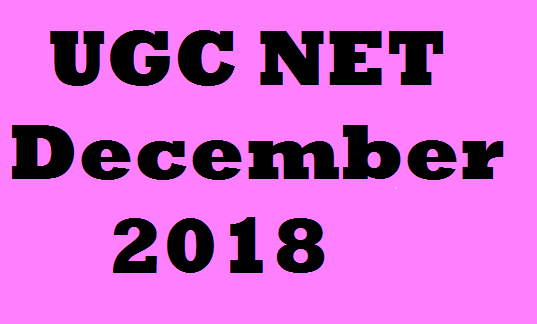 UGC NET December 2018 - The application for UGC NET December 2018 has been issued and registration for application has been started from 1st September 2018 and organized by National Testing Agency (NTA) under UGC National Eligibility Test (NET) University Grants Commission (UGC). The registration process begins for the UGC NET December examinations. The registration process for the UGC NET December Examination 2018 has begun on 1 September 218 and will continue till 30 September 2018. Eligible candidates can apply on UGC NET's official website for December 2018 and register themselves. UGC NET will be held twice in 218 years till this year, the first starts from 9 December to 23 December and the second exam will be held in July 2019 next year. Below are some steps to register for UGC NET December. The application process starts on the 1st of September 2018. Application process ends on 30 September 2018. The application will not be accepted after the last date. Total process for application is 4 steps. Photograph of a candidate should be between 10 KB to 100 KB. The Signature should be between 4 KB to 30 KB. Different Application fees are different for the different category like general, OBC, SC, ST, women candidates. Note: For other details and registration, please visit the official website www.ntanet.nic.in and read carefully notification regarding UGC NET December Exam 2018 before applying. Please Note that please read carefully official notification before applying. I hope You like this post very much and please keep visit regularly for more updates.